This is the second of five green tips where we look at ways to transform “useless” junk mail into stylish and free gift wrap. Did you receive any beautiful or festive junk mail yesterday? At this time of year, it can be a welcome resource for free gift wrap. The world would be a better place without any junk mail, but until that day arrives, we might as well look for ways to reuse it to our advantage. Giving it one more life before it hits the recycling pile can be fun, frugal, and fabulous. Yesterday’s tip was spotting the holiday symbols. Today, we’ll look for striking visual images. Once you start looking, you’ll see that there are lots of eye-popping images in junk mail and glossy inserts. The ad industry uses some of the most talented photographers and graphic designers money can buy (even better than the gift-wrap industry from what we can tell). Once you start looking, you’ll be amazed at the variety and sophistication of images you can reuse for gift wrap. The striking image of the woman with a row of red cardinals on her arm came from an ad for a home builder. Coincidentally the tulip (see above) was from another home builder. (I guess they know the images that will catch my eye.) Flip through your junk mail and notice what is grabbing your attention. Think of the person who will be receiving the gift. Do they love fashion? Or the outdoors? Or music? Chances are, you’ll find images galore to suit every personality on your gift list. But what do you do if your junk mail has a bold commercial message on it? Exploit it! For some presents and some recipients leaving the message in can give it a very funky look. In the case of the cardinals ad, however, I went for minimalism. I cut out the messages because I liked the simplicity of the woman against white. Another trick is to cover the message with ribbons (a subversive technique not sanctioned by ad types). 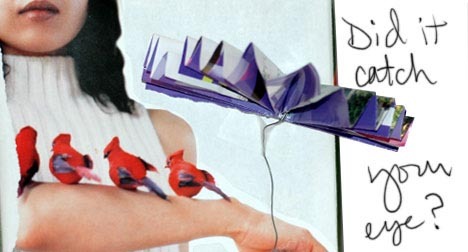 The bottom line on reusing junk mail is that you can do it in so many creative ways. Loosen up and you’ll discover your inner wrap star. This is the second of five green tips Franke is writing for PlanetGreen, the bouncy offspring of Treehugger.com and Discovery Channel. Photos of junk mail gift wrap by Franke James; Ads featured in gift wrap were from unsolicited mailings or newspaper inserts.